Rory McIlroy says he is determined to fill the void left by Tiger Woods. The American has withdrawn from the Masters after back surgery, leaving McIlroy arguably the biggest name on show at Augusta next week. The 24-year-old said he expected "a little bit" more attention due to the absence of his friend and rival. The Northern Irishman added he would like to dominate the game like Woods, Vijay Singh and Phil Mickelson had done in the past. "Golf's in a funny place at the minute," McIlroy told BBC Sport ahead of this week's Houston Open. "You are getting so many different winners and there are not as many guys dominating the sport like in the past with Tiger, Vijay and Phil. "I'd like to establish myself as that sort of player and someone's got to step up, so I'm trying to be that person and it would be a great place to start next week." With victories at the 2011 US Open and the following year's US PGA, McIlroy won his first two majors at a younger age than Woods, but he has yet to add to that tally. 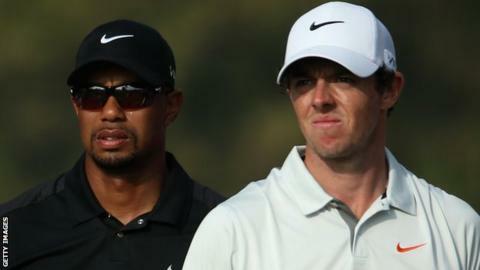 McIlroy said he was not shocked that Woods had pulled out of the year's first major. "I knew that it was going to happen, but I didn't realise it was so serious that he needed surgery," he said. "Obviously everyone wishes him a speedy recovery and hopefully he gets back very soon because golf is better with Tiger Woods playing." McIlroy has his own theories on why the 38-year-old Woods is proving so injury prone these days. "He's had four operations on his left knee, he's had operations on his Achilles," said the world number seven. "It seems like his lower back has been maybe working a little harder than it should have, to compensate for the surgeries he's had in his lower body. "So I think surgery is a good thing for him. He's got the best advice in the world so he will only come back when he's ready to play."